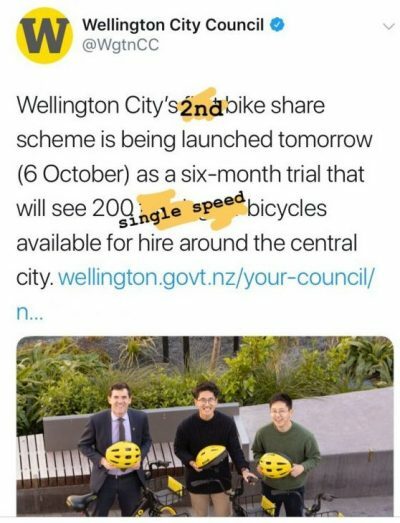 Onzo starts in Wellington this weekend with 200 bikes available in the central city for quick, easy and cheap hire (25 cents per 15 minutes). The Onzo bikes are ‘dockless’ (so, no need for special parking spots or stations) which is fuelling our excitement. Use your smartphone to download the app and locate bikes that are available to hire. The new Onzo service is only a pilot in Wellington until end of March 2019 – so get out there are try it! Bike-share services have been running successfully in many cities for years – check out this cheerful interactive history by Citylab. And, this isn’t the first bike-share for Wellington (although the first with official backing by our Council). Not the first for Wellington! 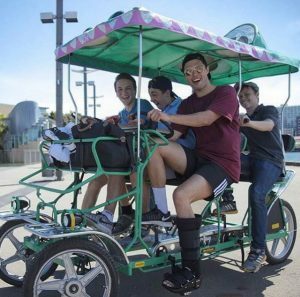 Onzo recently clocked up 100,000 rides in Auckland and are about to add e-scooters to the mix up north. 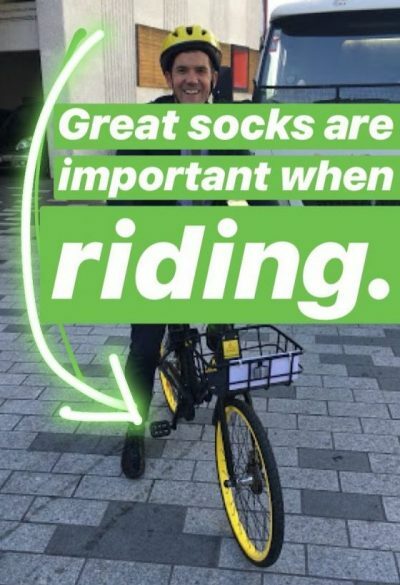 Their Auckland crew are skilled at locating ‘kidnapped’ bikes (where the cyclist abandons the Onzo bike in a spot not accessible to the next customer) and have smartly turned their stories of the most unusual places into social media gold. 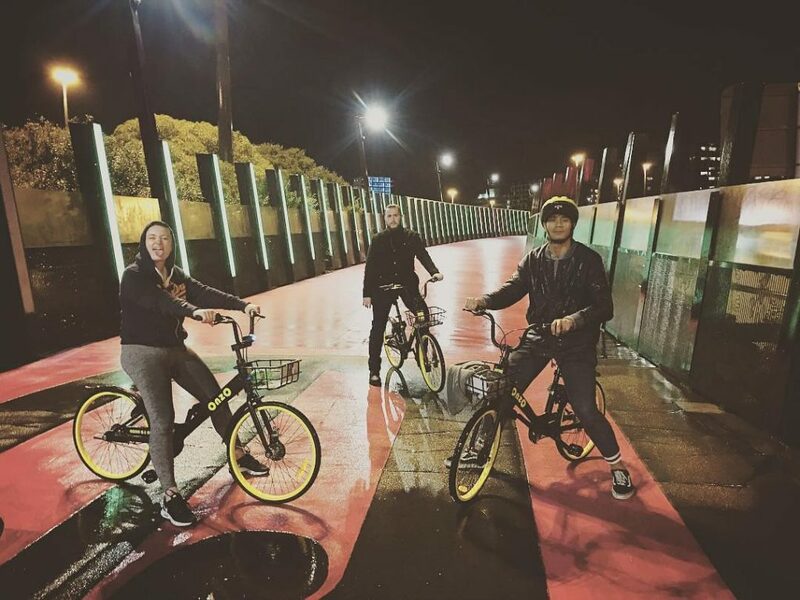 Onzo gangs of Auckland use Instagram to share rider-less Onzo sightings and snap their group night rides. Will a similar online following start up in Wellington? More people will be on bikes this summer in Wellington than EVER before. Welly is the home of central city mountain biking, an e-bike start up and waterfront crocodile bikes – and plenty daily commutes made on bicycle – so more bike sharing options makes sense and makes us happy. Onzo says their mission is “to improve the quality of urban life by providing an affordable way for people to get around, while at the same time reducing congestion and helping the environment” – sounds good to us! We do wonder though.. Why do we only get a short pilot of bike-sharing service? It’s been a strong success in Auckland after working through early teething problems over a year ago. And anyway where’s public bikeshare been for the last 10 years anyway? Christchurch has had extensive piloting and Auckland’s been not far behind. Has Wellington’s investigation of this essential service been another important conversation about central city transport improvement, that’s been put on ice “because Let’s Get Wellington Moving”? Stay tuned as we keep an eye on Onzo, bike sharing and the Council’s assessment of the new service. We’ll also tackle the Big Issues with bikeshare: helmets, footpaths, and of course hills! Are you excited to grab an Onzo for a quick whirl around Wellington? Snap a pic of yourself and your Onzo bike gang! Chuck it on instagram and tag us in!